WASHINGTON, D.C. -- Forty-three percent of Americans now consider it a good time to find a quality job, marking the fourth straight month that at least four in 10 Americans have been positive about the U.S. job market. Prior to January, the last time 40% or more felt this way was in the summer of 2007, before the recession. 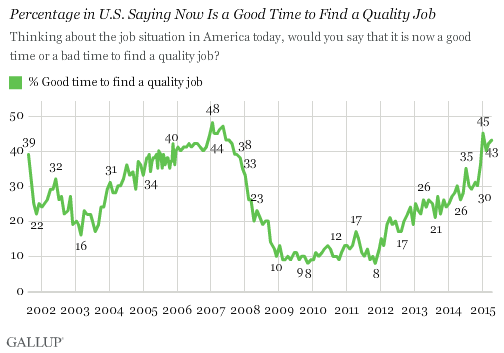 The majority of Americans (53%) continue to say it is a bad time to find a quality job, but this too is more in line with views before the recession than after. After peaking at 48% in January 2007, the percentage of Americans who said it was a good time to find a quality job dipped below 40% in September 2007 -- and remained below that threshold for the next seven years, through December 2014. In that time, the percentage fell steadily as the effects of the Great Recession took hold, reaching a low of 8% in November 2009 and again in November 2011. Since then, Americans have slowly regained their optimism about the job market. This accelerated in December 2014 when the percentage of Americans who thought that it was a good time to find a quality job jumped six percentage points to 36%, and then jumped another nine points, to 45%, in January. 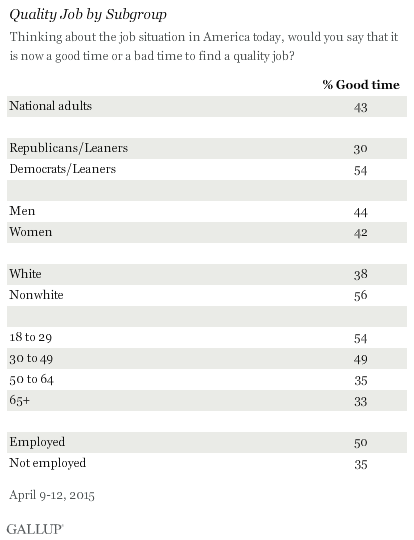 Democrats and those who lean toward the Democratic Party (54%) continue to be more likely than Republicans and Republican leaners (30%) to say now is a good time to find a quality job. The outlook on quality job prospects is related to partisanship, with Americans being more optimistic if they are a member of, or lean toward, the political party of the president. There are other demographic differences as well. Younger Americans are more likely to say now is a good time to find a quality job than those aged 65 and older, 54% vs. 33%, which may be a factor of partisan divides. Employed Americans (50%) are also more optimistic about the job market than those who are not employed (35%). Gallup found the same trend earlier this year, although the divide is more pronounced now than it was in January. Americans' views on the availability of quality jobs are significantly better this year than they have been for the previous seven, in line with the improvement Gallup has seen in other economic measures since the depths of the recession. For example, workers' reports of job creation at their places of employment had been increasingly positive and now hold steady at the upper end of what has been found since Gallup began tracking in 2008. Gallup's measures of unemployment and underemployment remain lower than they were prior to 2014. And the U.S. federal government's measure of unemployment has stayed consistently below 6% since September 2014. While some worry the economic recovery is not yet helping average Americans, optimism about finding quality jobs is clearly higher among Americans than it has been for the past few years. Results for this Gallup poll are based on telephone interviews conducted April 9-12, 2015, with a random sample of 1,015 adults, aged 18 and older, living in all 50 U.S. states and the District of Columbia. For results based on the total sample of national adults, the margin of sampling error is ±4 percentage points at the 95% confidence level. All reported margins of sampling error include computed design effects for weighting. Washington, D.C., was first for Payroll to Population (P2P) at 54.1%, and Salt Lake City had the lowest unemployment at 3.5%, among the 50 largest U.S. metro areas in 2014. Tampa was last in both P2P (38.2%) and unemployment (10.8%). Forty-five percent of Americans now say it is a good time to find a quality job, up from 36% in December and yet another indication of the public's perceptions of an improving economy. The measure has not been this high since May 2007.